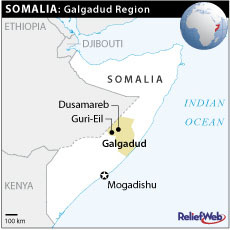 An acute water shortage has hit central Somalia's Galgadud region, with local leaders linking the deaths of two children to a lack of water and food. "We buried two children, aged four and one-and-a-half, yesterday; they died of lack of water and food," Yusuf Guled, the deputy district commissioner of Dhabad, told IRIN on 24 February. He said the problem was most acute in Dhabad, 130km north-west of the regional capital Dusamareb, in Hanan Buuro, 30km west, and in Ada Kibir, 150km north-east. Guled said the local administration was receiving reports from outlying villages of more deaths. "There are more dying out there but we cannot help them." The region has had no rains in the past two years and the district's only functioning borehole has broken down, he said. He added that livestock - the economic mainstay of the area - and the population were equally affected by water shortages. "We have been trucking water from as far as 40km away," Guled said. "People in the diaspora have been helping but it is not enough and we need more help." He appealed to aid agencies, saying the Dhabad area was safe. "We have an administration and police who are capable of protecting anyone who comes here," he said. "If help does not come soon, a lot more people and livestock will die." In Ada Kibir, the situation was equally bad. "The drought here has never really gone away; for five consecutive years we had very little rains or none at all," Tahalil Aden, a resident, told IRIN. He said the only water available was being trucked from a borehole 45km away. "One drum [200 l] costs 150,000 Somali shillings [US$6] - that is three times the average daily wage," he said. Aden said the situation was deteriorating by the day. "We have had no help from anyone and we have reached our limit; not many here can afford these prices," he said. A journalist in Dusamareb told IRIN most of the region was suffering the effects of prolonged drought. "These are the worst affected but there are other parts in the region that are also in bad shape," he said. He said the situation was exacerbated by past insecurity. "Until recently, it was a battle zone between warring factions and aid workers were abducted here," he said, in turn forcing aid agencies to curtail their activities. However, the journalist said the security situation was improving. "There is no more fighting and most districts have set up administrations and are trying to woo aid agencies to return."